but words will never break me. The rhyme rattles around in my memory, the words a threadbare security blanket I used in grade school to keep the tears from breaking through. I had an image to uphold. I notice the same tendency in Finley. She doesn’t want to be seen upset and she works hard at it, sometimes even here at home. Tears are for private. Finley is acutely aware of the power of language. She has the words that she’s collected and categorized as hurtful. She bans them from her vocabulary and is vigilant about defending anyone who she witnesses them being used on at school. I try to model behavior that she can be proud of, rarely using the word hate, calling out when people say retard or fag. I have failed in the “I’m sorry” category, using it too much, too loosely. I’m working on it. 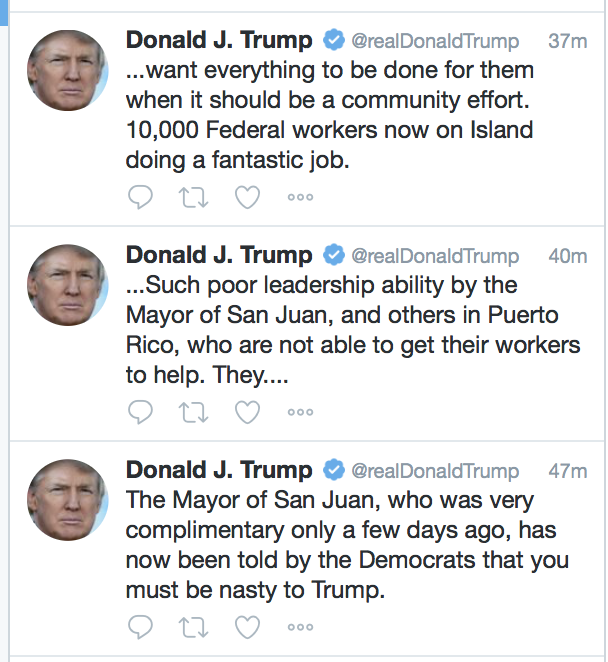 This morning when I saw the President’s tweets about Puerto Rico a lot of words bubbled forward. They would not have made Finley very proud of me. President Trump proving yet again that he is guided entirely by his own ego. I have heard people say that Trump is a “straight talker” and that he is “a refreshing change.” I listened as we were told that his conversation with Billy Bush was locker room talk. I watched the debates and interviews surrounding them. 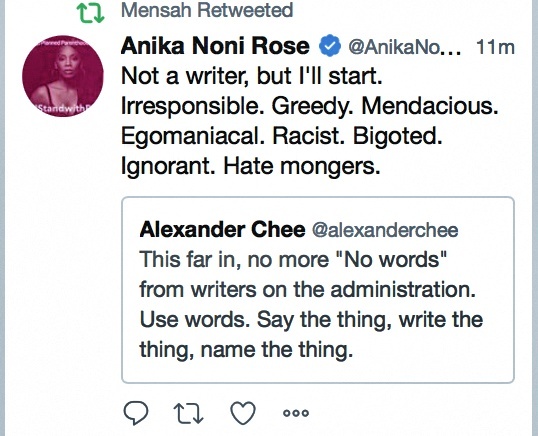 The way his lips moved around the words he used to insult people, mostly women, reminded me of how it feels when the bile shoots from my belly and forces its way through my esophagus before splashing in the toilet. I looked at his words on the screen and then other words came to mind. I thought about the times people have defended silence by saying they aren’t comfortable speaking up and it won’t matter. My voice still shakes when I speak in public, sometimes to the point that it makes people uncomfortable. I haven’t run out of a room from embarrassment since pushing away from the podium in Mr. Fishback’s English class in 1989. I talk through the tremors. Now, as I reach a breaking point with words and whether or not they matter, I realize that they can break us. Words can immobilize us. I don’t mean the words of this vile individual who is at our country’s helm. I mean our own words. I can’t even is popular and kind of satisfying to say, but it isn’t harmless. Even if we say it in jest, I think we are in a moment when we must talk about what we will do. The shock and horror must be overpowered by the push to action. It will not stop. It will be hopeless. And I swear that it will get worse if we don’t start putting words to this. It’s time to realize that the words apply to us if we stand by and let people die because the President has a beef with someone. He needs to do his job. We need to do more, and not just at the humanitarian crisis level. Be kind eyes at the grocery store to the person having to send an item back because their WIC won’t cover it. Call the school and ask if they need gently used clothes in the nurse’s office. See if any local organizations take recycling to help fund their programs. Look the person at the service counter in the eye and ask them how their day is going. Take a quick look, are you harboring any racism or prejudice? You don’t have to hide it, you an resolve it. Eliminate it. Protect yourself from scenarios that tear you down. A huge part of being available to others is making sure that you take care of yourself. Our acts don’t have to be about money, but we certainly have to act. I keep saying it—whether it’s taking a knee, taking a stand, calling it out, or working it out, the reality is that we have a choice and it comes down to doing something or doing nothing. It’s harsh, it’s uncomfortable, and it just is where we are. Maybe tears aren’t for private anymore. This morning as I sent out a tweet about the President’s comments, it gnawed at me that I wasn’t doing anything new. I was speaking up, sure, but I wasn’t doing more than before. Sean and Briar’s voices traveled up the stairs. They were in the basement practicing a song for a funeral. Briar had never met the woman and she barely knows the friend of Sean’s who requested the song. Still, she was down there singing her heart out, willing to go and stand before a crowd in a church she’d never been in to bring comfort to people. I wanted to share a little bit of it. I don’t have their permission and it was an early morning run through, both of them sick and dusting off the morning grogginess—for me it makes it that much more beautiful. Donate to Puerto Rico. Even sharing the link is helpful. Or read more here. Cool Mom Picks did a great round up. Find out more about transgender rights. Learn about how to support transgender teens. Volunteer…you can ask the Chamber of Commerce in your town, reach out the YMCA, or ask the foundation of the hospital. Talk to friends. Maybe you can create a new way to help. You always come through. Near breaking point myself on this. Thank you. As a singer, hearing your family harmonizing together fills me with joy and a little envy. As a Canadian, seeing your words (and the words of so many other heart-sick Americans) gives me hope. And as someone who knows that she needs to DO more, the things YOU are doing inspire me to act, not just watch. I am so right with you. It is viscerally painful for me to read his tweets or hear his voice. Every time I think he cannot get any worse, he does. I’m getting very fearful for how we will ever undo all his damage. Language has become like congestive, choking fog as of late. It’s blaring everywhere, all the time and really, rarely is it civil, humane or god forbid, loving. Choosing appropriate words has assumed a certain moral responsibility like no other time in our collective history. This of course doesn’t mean I presume naively the velocity or the intended cruelty of vile utterances is about to metamorphosize into the parables of Thomas Aquinas or Augustine of Hippo. Still, as you observe, we can certainly and must all do our part, more thoughtfully and more often. Silence is not always golden. Recently there was an essay by Marilynne Robinson in the NYT Sunday Book Review on the Author’s Note page entitled, ‘Marilynne Robinson On Finding The The Right Word.’ (https://www.nytimes.com/2017/09/22/books/review/marilynne-robinson-on-finding-the-right-word.html) It seemed quite appropriate to what you had written here on your blog. I’m with you on this. I know I definitely need to do more than what I’m doing now. Just need to figure out where I’d like to start first though. The Power of Language — Amanda Magee — С любовью к людям!